Different finishes can be achieved by using different tools such as trowels, sponges, or brushes and of course different products and technique. The art in traditional rendering is (apart from getting the mix right) the appearance and finish of the topcoat. The most popular render finish is sponge finish, which gives a very neat, smooth and modern finish. Different tradesmen have different finishing styles and are able to produce different textures and decorative effects based on their knowledge and experience. 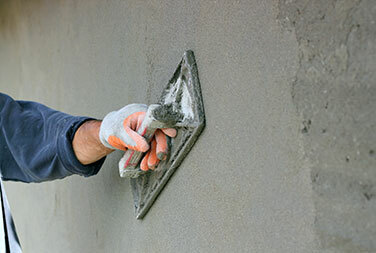 Various finishes, patterns and textures are possible with traditional sand and cement render such as sand, sandstone, scratch coat, undulated or swirl. Then, the options broaden with specialized render finishes offered in our Pro-Series – there are many creative and interesting uses of render that can make your project stand out such as German Smear, lime wash or clay like finishes, marble, stone, stone chip, Venetian plaster and Marrakesh render. Render-vations cover all forms of Render finishes and will be able to help you with the selection process.